Opimised for Desktop and Laptop devices. This calculator has been optimised to work on laptop and desktop devices. Please maximise the browser window if you are using a laptop or desktop. Warning: This is a prototype. Do not rely on the results. 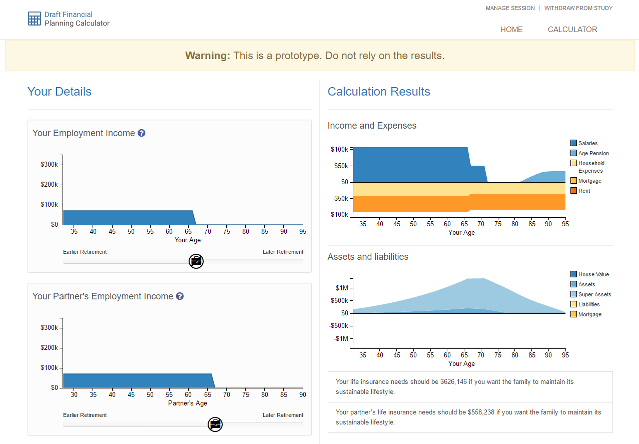 This prototype calculator is part of a process in developing a coherent framework for the design and use of financial calculators for the use of decision making on retirement, asset allocation and insurance. The final outcome of the project is expected to be a “standard” calculator that can be used by financial planners and individuals both to provide/receive advice and to demonstrate the potential (stochastic) outcomes of these decisions. A significant component of the project will be to investigate how users utilise and understand the calculator, given different socio-economic status and lifestyle preferences. The project will contribute to greater financial literacy engagement in superannuation and benefit trustees offering calculators and in the design of default options. The other main component of the project is to analyse users’ risk preferences as indicated by their responses to the This project has been funded to date by a Centre for International Finance and Regulation (CIFR - www.cifr.edu.au) grant. The web application development of this project has been done by Cliff Senkbeil (www.grifby.com) while James Maitland is the developer of the risk preference downloadable link. Earlier versions of the calculator were developed by Robert and Michael Asher who retain intellectual ownership of some of the code. This prototype financial calculator is designed to help you work out how much you should save for retirement.